Home » Preparedness » The Bucket List: The many uses of buckets and help finding the right one! The importance of a good bucket cannot be stressed enough. There are a lot of different buckets and some are better for some things than others. I am going to talk about a few things to pay attention to when it comes to buckets. After you read that we will get into the many things you can do with the humble bucket and I will suggest some buckets based on my experience homesteading and farming. Prepare to be amazed at just how much the bucket is capable of! 1.0.9 Metal buckets can be made into rocket stoves. 1.1.20 Fill with heavy objects to add weight to a vehicle for better traction in ice and snow. 1.6 There are tons of other uses for buckets out there! While we are all used to the whole 5-gallon bucket thing, it is important to realize how much that thing is going to weigh full of something. While larger buckets often offer the most carrying capacity for your dollar, going with the big one can lead to the temptation to carry more than you should. A 5-gallon bucket of water weighs around 40 lbs and you are carrying all that with just one hand a lot of the time. Don’t get me wrong I have used two and walked awkwardly but that is no fun and something I did when I was a lot younger and less strong. Bigger buckets also take up more space so if you have an area in mind where they are going to be stored, then consider the size. Sure you can get buckets for a few dollars but they are going to be thin. The thinner the bucket the more likely it is to break under stress or impact. Buckets are made using various formulas of plastic, galvanized metal, and stainless steel. These are the most common types but I am sure there are others. Sometimes plastics and rubber are combined. Stainless steel is the most expensive but it is suitable for use for food and beverage. For animals, I don’t find stainless necessary except for when milking or if you are curing and brining meats. There are food grade plastics out there too. Plastic is always going to be the least expensive option. Galvanized steel is okay for some things but it does eventually rust out and it costs more than plastic in most cases. A comfortable handle or bail is important to have. Carrying heavy loads in 5-gallon buckets with no plastic cover on the metal bail has definitely caused me some pain. A thicker handle is nice and offers some comfort. You can make your own soft cover by getting the foam pipe insulation that looks like a pool noodle and wrapping that around. Duct tape or another heavy duty tape can be wrapped around it. This can be a big help to your hands when you got a lot to do and it is inexpensive. You may even already have what you need. Buckets can vary a bit in shape. Some are quite a bit wider on the top than the bottom while others don’t taper at all. This can affect the total space taken up by the bucket. If you need to fill a specific space bear this in mind. I recently noticed that I did not have the right number of buckets to deep clean my house. Smaller 2-gallon size buckets are about right for me. For household cleaning, you don’t have to splurge on the most expensive. The type with a wringer in them is good for squeezing out rags or mops. Sometimes storing stuff in a bucket is the way to go. Look at all the food buckets that people buy up for long-term food storage! You can even get special lids that seal better and keep things out. I was sent an Ark 360 food bucket that had a really amazing lid. I wish the food was better that was in it but the bucket and lid are top notch. I use my stainless steel buckets for making corned beef or curing small cuts of ham or bacon. They have a lid and work very well. The larger 4-gallon size fits in my fridge and can hold a lot of meat. Food grade plastic buckets with lids can work as well. This is my favorite way of brining and curing. It keeps anything nasty out and doesn’t react with the salt or other curing agents. You have to cut up a lot of stuff to can and having some buckets on hand is a good place to put cut up veggies and meats or waste from processing. I use buckets for cleaning and mixing so I just have to fill my jars. This keeps the process streamlined. While you may need to put a few holes in the bottom for drainage, buckets can be excellent for making into planters. THis is a good use for a bucket that is approaching the end of its useful life so long as it is not falling apart too much. If you have a good strong bucket and bail, I have seen people hang buckets from windows for a makeshift window planter! The buckets were hanging so that if they fell they would hit the roof of another building though and not a sidewalk filled with people. You need to use some common sense but I thought it was an innovative approach to urban gardening! Even if you have a small milking machine, you are going to want a few good buckets around. Stainless steel is the standard for the dairy industry because it is easy to clean and doesn’t get scratched up as easily as plastic. Batteries can leak and damage things. A plastic bucket and lid are a good way to store batteries for the long term. Metal buckets can be made into rocket stoves. If you got a steel bucket you can cut out a side to use as a firebox. The opening of your bucket may be too large to sit a pot so you may need to get creative and build an eye of sorts. A few buckets and some PVC pipe can be used in conjunction with gravel, sand, and charcoal. This will yield water that is free of bacteria, viruses, and heavy metals. At some point, you have to replace the charcoal but this is usually only after months of regular use. This will vary based on just how dirty or contaminated your water going in is. Pre-filtering through cheesecloth can help increase the life of any filter. A clean white t-shirt or cloth also works. You can also let the water settle out by leaving it to sit for hours and carefully siphoning or pouring into your filter. Trash service is a luxury that hasn’t always been around. During a SHTF scenario, you are going to want to reduce it to as small a size as possible. Two buckets can be used to compact. Just take 2 similarly sized buckets. Fill one with trash and use the other bucket to smash it down. While you have to be careful, especially with buckets that are particularly tall, they can be used to give yourself a boost when trying to reach a spot. Just be careful about weight limits. Step carefully to test it out to make sure it can support you. Having a helper steady it is another thing to consider if you are concerned about balance or dealing with unlevel circumstances. There is no reason why you can’t put together survival kits on your own. There is a lot of advantages to this because you can make them custom to fit your needs or that of particular members of your family. Ingles is the major grocery store in my area and the bakery goes through a lot of frosting buckets. I like them because they are 3-gallon size and come with lids. They are only a few dollars and you are saving them from recycle or the landfill. Sometimes they have them out in a cart with a sale sign but you can also ask them and they will check to see what they have. Check bakeries, restaurants, and institutions and see what they have on hand or if they are willing to sell you a few. I was getting them for as little as a $1-$2 each but that has been years ago. Even if they have gone up in cost a bit they are a bargain for food grade buckets with lids and you know what has been stored in them so it is not a big deal getting them used. There are two ways to create a portable toilet out of a bucket. If you want to use it as a covering on a hole in the ground then you will have to cut out the bottom. For comfort, you can attach a pool noodle around the rim and attach with glue or whatever you have on hand. The other way involves using a garbage bag liner that you can dispose of waste in. This can be helpful if you travel or if you run into septic or plumbing issues. Who hasn’t been in the position of having some leftover charcoal at the end of the season? Or what if you want to make your own lump charcoal or activated charcoal and store it? 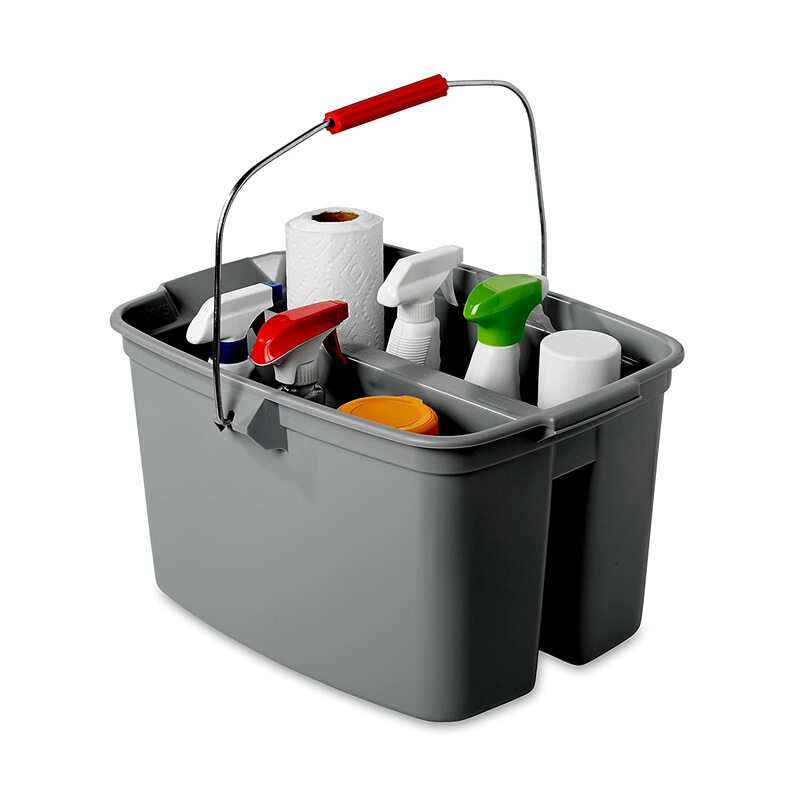 A bucket and lid is a great way to avoid messes and make sure that it doesn’t get wet or absorb moisture, odors, etc. To find out how to make activated charcoal at home, check out my post. A bucket with some entry holes and mounted on a pole can make a cozy birdhouse. Plastic can get hot so this may be a birdhouse that is best for shadier areas or climates that don’t get too hot in the summer. Cut a hole in the bottom of a bucket with a lid and attach a PVC 90 degree or 45-degree elbow. the feed will gravity feed down as wildlife eat it. You can soak clothes in a bucket to remove tough grime, dirt, and grease. The addition of an agitator like that shown below allows you to really get the dirt out. During an emergency, this can really help out. My post on off-grid laundry options lists some equipment and methods that are useful. I have bought plenty of those expensive auto feeders over the years. To make your own, drill or cut some holes near the bottom but on the sides of the bucket. Place the bucket in a pan or feed dish and then fill the bucket with feed and replace the lid. You can put a lot of feed out and not spend $40 or more on an auto feeder. If you are raising a lot of chickens, turkeys, or geese, this can save a lot of time and money. If you are just starting out with birds it might be good to not invest too much in equipment until you know if it is something you want to do a lot of. Just set a bucket under a downspout, gutter, or roof and you can collect a lot of rainwater that you can use for watering gardens, animals, etc. You could even filter this water and use it for drinking in an emergency. A 1,000 sq ft roof will yield 600 gallons of water in a 1-inch rain! This means in a lighter rain you can still fill up a lot of buckets. A well-oiled gun can be placed in a bucket, and this will keep moisture and dust from accumulating. You can fit a lot of handguns in a bucket. Just be sure to add some padding or cases if storing multiples in a single bucket. Metal ammo cans are pretty obvious. A discrete looking bucket can hold quite a few rounds and keep water from being an issue. I still would recommend using a trash bag or something to line your bucket before putting ammo in. Even if the bucket cracked there would be a chance that the bag would keep ammo in good enough shape to shoot. Tired of little pieces of kindling going everywhere and getting scattered or just want an easy way to carry it into your house? A bucket can hold enough kindling to start a lot of fires and it can be moved around with ease. Small amounts of concrete can be mixed using a bucket. If you have a lid you can even put it on and roll it around to mix if you don’t want to use a stir stick or hoe. While you wouldn’t want to mix a lot this way, it works and gets the job done. I don’t know about you, but I got a lot of small things that while I use them, I don’t want them just laying everywhere. Buckets are great for organizing whatever life throws at you. If you need to mark a spot on the water, you can use a bucket and rope to make a float. This can also be used as a float with a rescue device. A lid with a good seal makes the whole thing better. Sometimes you need to dunk water, and a bucket is a great choice for the job. A bucket brigade can work. A bucket of water will help contain a fire and keep it from getting bigger while a lot of buckets can save a structure from being a total loss. You can put a light inside of a white bucket, and it creates a more distributed and larger lantern wherever you need it. Cutting holes and attaching a rope like you would make a buoy creates a good solution to a fish trap. Put some bait inside, and you might be surprised what you catch. Any extra protein during a SHTF situation is going to be welcome and increase how long your supplies hold out. We might live in an electronic age now, but that could change quickly if SHTF we could be back in the paper age before you know it. Paper has the major disadvantage of being prone to water damage. A bucket can prevent your paper products from being ruined. You could use it to store toilet paper too, but I was thinking notebooks or even pictures and other things that are special to you. You can fill a bucket with rocks or sand and use it to anchor about anything you want. During a windstorm or similar event, this could save some of the things you care about. Fill with heavy objects to add weight to a vehicle for better traction in ice and snow. Putting some weight in your trunk can help out if you don’t have four-wheel drive and want to add some traction. This is an old trick but not something people always think of. It is easier than chains. A bucket that is food grade is ideal for gathering up a lot of food. Plenty of vineyards use buckets for picking grapes in our area rather than the crates you so often see. If you have a lot of tomatoes or potatoes to harvest, buckets are the way to go. Picking mushrooms and foraging are another use. If you want to allow for some air flow you can use a drill and a small bit to add some holes. For some things like mushrooms, this is a good idea, especially if you are going to be out foraging for a while. I lived rough in my mid and late 20s. I thought I was going to freeze my hands off washing dishes. Being able to heat water and use a bucket is a luxury when you are living that way. 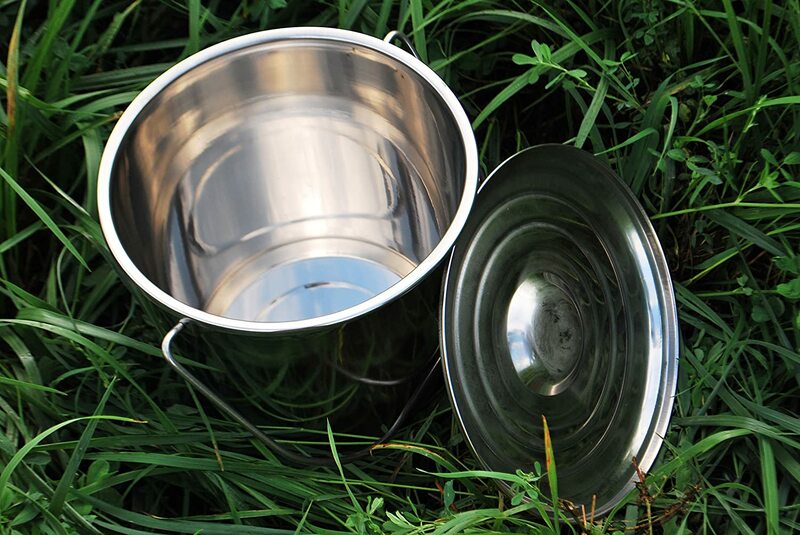 In a grid down or emergency situation, a bucket makes a good soaking bucket or wash basin. I like the high-quality dog foods out there, but since the quality is high and the ingredients are fresher with fewer preservatives, it can go bad faster. I got some very large dogs, so it is not as much of a problem for me usually, but if I want to put dog food back, I need something that seals and keeps moisture and insects out. A bucket is a good choice and holds up to 25 lbs of dog food or cat food depending on the size of the kibble and the shape. Airspace can add up. A bucket can be used as a primary fermenter for wine, and if set up with an airlock it can be used for beer or secondary fermentation of wine. You can save the leftovers from winemaking and distill them. This is called grappa, but it can be distilled enough to use as a disinfectant or for making tinctures and extracts in a survival situation. I did a post on fermentation where I talk about the methods and advantages of using a bucket and airlock to make sauerkraut. A 5-gallon bucket may not be the largest trash can but it is sized right for some applications, and it is easy to dump and clean. Using a trash can that is this size also means you don’t make yourself lift too much garbage at once, and you have to dump them more often, so things stay tidier. I have used a lot of the bakery frosting buckets that I mentioned you could just get at the grocery store. They have to take a lot of weight and be strong for shipping. They are cheap, but they will last a few years even if you treat them rough. If you are just using them for food prep, they will be around a very long time. There is nothing like the Fortex brand of bucket. I bought a 4 pack of these 3 years ago and they are still in very good shape despite us being very hard on them and leaving them out in the field and the sun. I like the 2-gallon size because it works well for a lot of uses and we are not tempted to lift too much weight when using them. You also get a really good deal when you can get the 4 pack. While I generally don’t like a lot of bright colors, I like that a lot of the Fortex buckets are bright because that makes them easy to see so you don’t run them over, hit them with the mower, or just lose them. The main place I have seen the 4 pack is at Tractor Supply and they run under $20 for the pack normally. If you want a really good stainless steel bucket that is easy to clean and doesn’t have a lot of places for bacteria to grow then you want to buy a stainless steel bucket that is designed to be used in the dairy industry. My mother-in-law bought us a 4 gallon and a 1-gallon milk bucket when we were milking our cow, and although that didn’t work out in the long run, we have used those buckets countless times for canning and food prep. I have even made small batches of wine in the larger bucket. I don’t have a particular brand that I think is better than another. As long as it is made for dairy, you will probably be really happy with it. A lot of the time I just go for a cheap bucket for cleaning. I have been known to just use the bakery buckets and mark them with a Sharpie so they don’t get used for anything else. For high-quality cleaning buckets, I recommend Rubbermaid. I have always been happy with their products. There are a lot of different sizes and styles of their buckets so you have options to fit your lifestyle and needs. There are tons of other uses for buckets out there! I just touched the tip of the iceberg when it comes to uses for buckets. I would be interested to hear what other uses you think of or any great stories where a bucket saved the day for you! Please share in the comments below!